With a bowling alley, a pub, a prison and a nuclear power plant just down the road, Springfield, Vt., likes to think itself a real-life version of the home of "The Simpsons." Now, the town is going all out to prove it, joining 13 other Springfields from across the nation — including one in Ohio — in a contest, with the winner hosting the big-screen premiere of "The Simpsons Movie" July 26. The public will choose the winner in a USA Today online vote. Springfield, Ill., has its own power plant, run by a man who looks a lot like Mr. Burns, head of the nuclear plant on "The Simpsons," said Tim Farley, executive director of the Illinois' Springfield Convention and Visitors' Bureau. The school is identical and the city is not far from Shelbyville, the town next to Homer Simpson's Springfield, he said. "We feel like Springfield has a lot of curious similarities," Farley said. But folks in Springfield, Ore., the home state of "Simpsons" creator Matt Groening, always thought it was their Springfield on the Fox TV show. "It was a shock, that we had to prove it," said Niel Laudati, community relations coordinator. Every Springfield in the nation was invited to take part, including the Springfield in western Ohio, about 65 miles west of Columbus. Each has been asked to submit a three- to five-minute video showcasing their towns. Some had a cow over the idea. Springfield, Minn., declined, saying it was nothing like the dysfunctional town on the TV show. As the June 28 submission deadline approaches, the Springfields aren't giving away many details, just upping the ante. "We just got Senator Kennedy to be in our Simpsons video," said David Horgan, producer of the effort in Springfield, Mass. "I can't give it away, but he's hilarious." Last week, more than 300 people showed up to be in the final scene of the Massachusetts entry. "We had a hair salon dyeing hair blue," and piling it up like Marge Simpson's 'do, said Azell Murphy Cavaan, community relations director. 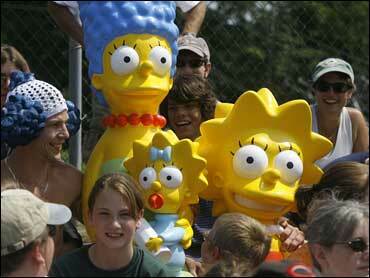 Illinois and Massachusetts got local input online for how to show their "Simpsons spirit." Oregon held a public meeting with the mayor. Companies have volunteered their video-editing services, food and beverages. 2Vermont's Springfield planned to show off buildings with "Springfield" in them — the bank, a movie theater — in a scene in which Homer (Burlington talk show host Tim Kavanaugh) runs through town chasing a big, pink, rolling doughnut. On Tuesday, 17-year-old volunteer cameraman Alex Campos of Barre filmed Homer charging after the doughnut through a Little League diamond and plowing into his son, Bart. The southeastern Vermont town's preparations went so far as to include a doughnut double — in case anything happened to the inflatable plastic pastry. Later they planned to film the final scene, in which Homer is chased by a mob into a movie theater. "We tried to keep within the spirit of the movie," said producer Brock Rutter, of the Vermont Film Commission, who also plays Bart. "Homer wrecking things and everything turning out in the end." The town doesn't plan to emphasize anything that might be offensive, said Patty Chaffee, head of the Springfield Chamber of Commerce. We're not "looking at it (as) being compared to. I think more for us it's a promotional piece, just getting our name out there." Voting ends July 9, with the winner announced the next day.